Tuesday Throwback: Make 7 Up Yours! Last week, I wrote about an A&W commercial which featured a thick-headed interviewee calling his potential boss “Mr. Dumbass.” This 7 Up ad from 1999 is associated in my mind. You know it…the one where Orlando Jones introduces the slogan “Make 7 Up Yours.” Of course, his shirt throws a lot of people off. I remember people wearing that shirt back in the day. Created by Leo Burnett Chicago, this new McDonald’s ad premiered during The Oscars. Finding a lucky penny is kind of a universal experience of childhood. So is missing the school bus, getting bopped in the face at an inopportune time, and being annoyed by your parents getting a flat tire. Of course, getting a flat tire in front of a McDonald’s is a joy if you’re a kid. Which leads to a simple and cute ending. 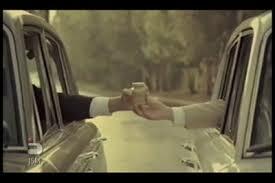 Grey Poupon had an absolutely classic commercial campaign in the ’80s. The original spot, which introduced the famous “Pardon me, would you have any Grey Poupon?” “But of course!” exchange between two men riding in Rolls Royces debuted in 1981. And now tonight during The Oscars, the alleged lost footage will debut. Car chase! Golf club jousting! Shooting! Fire! Caviar slicks! Bridge jumping into a grocery store! Brilliant! When I think of the brand that does my favorite commercials, Jameson Irish Whiskey would be a strong contender. In the past I’ve written about the Hawk of Achill and the ad where John Jameson arrives alive to his own funeral. Awesome. And now, Jameson has a new spot along similar lines. This one concerns a runaway train called the Iron Horse. I’m so glad the whiskey was saved and Ireland avoided the Prussian Incursion of 1807. Enjoy! A classic. Sure takes a true dumbass to call him “Mr. Dumbass” on a job interview. That’s some thick head on A&W. Yum. I’m not a fan of the doofy Geico musical duo. I find them to be smarmy and annoying. But any commercial that features retired NBA great Dikembe Mutombo swatting away things and doing his trademark finger wag is a winner in my book. And we’re back! I thought about this commercial today as I was drinking a can of Sprite. I’ve already written about a Sprite commercial on Tuesday Throwback, so I guess they have really memorable retro ads. Anyway, I think I remember this one playing a lot in the summer. ’06-07 maybe? It says it was uploaded in October 2006, so that might be right. I really like the visuals. You can totally see the sweltering summer sun and heat in that urban basketball court. I hope that’s water they’re jumping into, not Sprite. That would be sticky. Of course, the commercial is made by the chill, smooth song. It’s “Falling Away” by Hugh Wilson. I always thought it was “Falling Awake” (i.e. I’m falling awake with you), but apparently not.